The Scoop: Singles looking to level up their dating experience can turn to The Gutsy Geek for sound advice and support. Who is this nerdy dating wizard? He’s Rami, an enthusiastic blogger who gained XP in the dating scene for over a decade before meeting his dream girl at age 30. Rami has now created a treasure trove of informational articles and coursework to help shy guys (and gals) replicate his success. 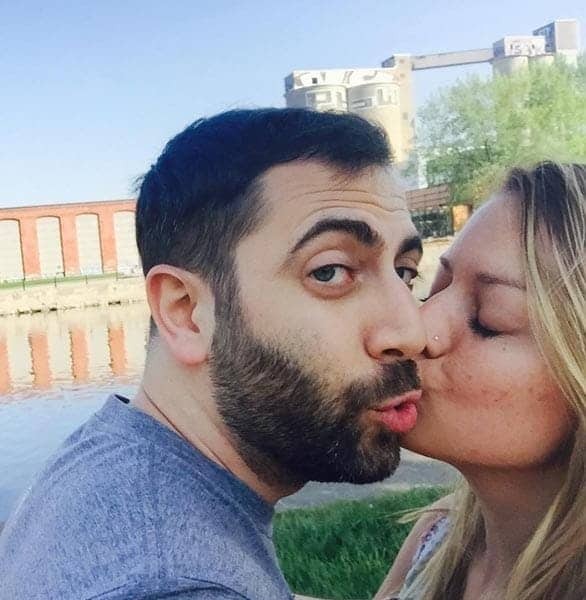 When Rami began blogging, his primary objective in life was to get a date on Saturday night. Under the moniker The Gutsy Geek, he wrote about the strategies he used and the lessons he learned along the way. He focused on short-term tactics and dating hacks men could use to attract women at a bar or a club. Now things have changed for Rami. He and his girlfriend have been together for five years and recently welcomed their first child into the world. After years of rejection, Rami learned how to achieve success in the modern dating scene. 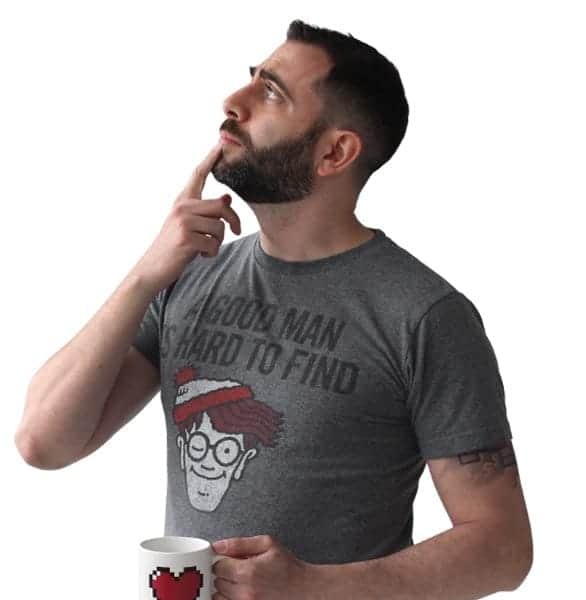 As a dating resource, The Gutsy Geek has matured alongside its author, and the blog now offers long-term dating and relationship advice for nerdy singles. Rami has also expanded the blog to include private coaching and online courses. Rami told us 2018 was a big year for The Gutsy Geek because he launched two dating courses, recorded dozens of podcast episodes, and formed a partnership with Coaching for Geeks. The Gutsy Geek isn’t just about scoring dates anymore. The action-oriented blog and coaching courses help men gain the self-confidence and interpersonal skills to create a relationship that goes the distance. “My advice is really geared toward how to meet someone long term, so my readers can enjoy the same love and trust that I have with my partner,” Rami said. Rami has spent years writing about his experiences in the dating scene. He has written about bad dates and great first kisses. He has tackled touchy subjects like how to use touch to create intimacy as well as common issues like how to get out of the friend zone. He has even written an entire post about approaching tall girls with confidence. Over the years, Rami has shared his thoughts about love and romance, and many readers have joined him on his journey and become invested in his story. Rami told us he used to post twice a week or more on Gutsy Geek to bring a larger audience into the loop and keep people engaged, but now he feels that he has established an avid geeky following and is content to speak directly to those guys. Anyone can reach out to Rami by email with a question or concern, and he usually responds within a few days. Or, if you’re serious about turning your love life around, you can create an account on Gutsy Geek and receive dating modules and personalized coaching with a 60-day money-back guarantee. Since he began dispensing advice on Gutsy Geek, Rami has inspired many single men to go out and get the girl, and some of them have written him thank-you messages. Rami said he has heard from men who lost their virginity or got married after taking his advice, and it means the world to him to know that he’s made such a monumental difference in so many lives. Online dating has become a major trend in the last several years, and many dating apps have exploded in popularity — which has fundamentally changed how men meet women (and vice versa). 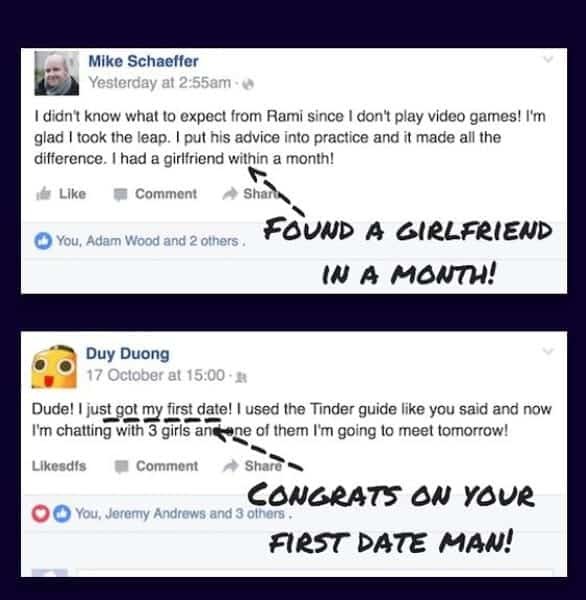 Rami’s online dating advice has helped many men upgrade their love lives. Men want to know how to use dating apps to land dates and get into relationships. Common questions in Rami’s inbox include “What’s a good online opening line?” and “How do I ask her out on Tinder?” Rami can answer these questions and more in his brand-new dating course. The Tinder Playbook has adapted proven dating strategies to the online world and given men a step-by-step guide through uncharted terrain. This course covers what singles need to know about online dating — from the photos to the bios to the opening lines. Rami offers a nine-step conversation flowchart to help men figure out what to say in an online chat, and he also provides 10 pre-written dating profiles and five tips for choosing attractive profile pictures. Now online dating newbies can get the hang of using dating apps to make connections and land a date. Looking to the future, Rami said he plans to expand his courses and create more resources for modern daters. His current courses focus on tips for men, but Rami said he’s interested in speaking to single women as well and helping them gain the confidence to ask men out online and offline. The Gutsy Geek is all about self-improvement. Rami remembers how it felt to be rejected, friend-zoned, and consumed with self-doubt, but he didn’t let those experiences defeat him. Every time it was game over on a potential relationship, he’d take a breath, try to learn from his mistakes, and start again. Instead of blaming the people or the circumstances, he looked inside himself and focused on what he could do to improve how he connected with women. He found success by staying positive and continuing to pick himself back up after being turned down. Rami has spent the last eight years teaching men how to meet women and build relationships. Rami said he’s worried by the bitter comments made by some single men online, and he wants to challenge their assumptions about the dating scene and women in particular. Rami also sees a problem in the old-fashioned dating norms dictate that straight men should always make the first move while straight women passively wait for their prince to hit on them. The Gutsy Geek blog encourages women to take control of their romantic futures and pursue the men they like. By taking such initiative, women have the power to improve the dating world for both genders. No need to be a princess trapped in a tower anymore — dating is a two-player game, after all. Rami draws from his own experiences in the dating world to inform and inspire his readers. He understands what it’s like to be rejected — he was once turned down by 60+ women. He also knows what it’s like to pick himself back up, gain confidence in his dating skills, and charm the woman of his dreams. As a dating coach and blogger, Rami builds men up and helps them become the best possible version of themselves. The Gutsy Geek offers how-to articles and online coursework to embolden singles in the modern dating scene. Rami stands up on behalf of the shy guys out there by offering sincere, thoughtful, and practical advice about dating and relationships. The Gutsy Geek brand has matured alongside Rami, and 2019 looks to be even brighter for this nervy nerd as he becomes a father and grows his online presence.